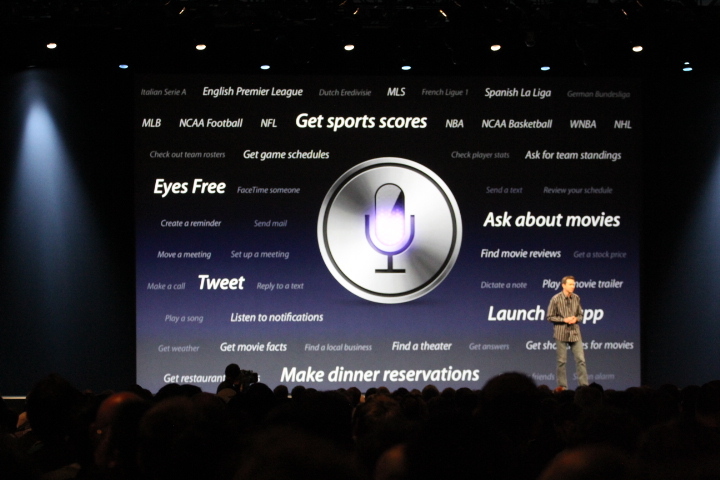 As demoed on stage today, Siri can now answer real-world questions about sports, movies, restaurants and more. These include”Who won the latest Lakers game,” “Find a great place for dinner”, sorting the answers by rating, and showing much more information such as average price and menu type. What’s more – Siri can now launch apps. Want to play Temple Run? Saying “Play Temple Run” will open the app. Even more impressive is that Siri is getting integrated with cars. 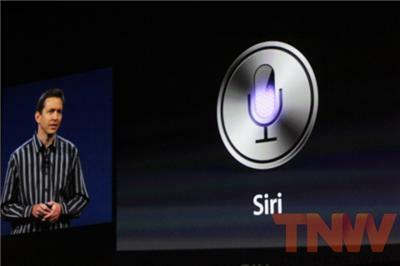 An ‘Eyes Free’ feature will mean that a special Siri button will allow you to use Siri while driving. BMW, Landrover, GM and Audi are among the brands lining up to offer the feature within the next 12 months. Another big, if expected, addition, is Facebook integration at OS level. With a single sign-in, you’ll be able to share apps, movies, TV shows and more from the on-device stores. You can also share photos, talk smack from Game Center, and more. 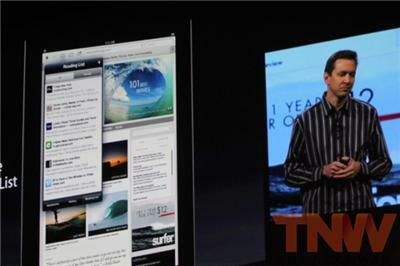 iCloud tabs arrive in iOS 6, meaning that you can sync your tabs from your desktop version of Safari with your iDevice. The offline reading feature from the desktop comes to iOS, too. Important to bloggers will be one new feature in particular – you can now upload photos to websites from Mobile Safari! This has long been a pain point when composing a post from, say, an iPad. You will be able to share albums of photos from your Photo Stream to friends in iOS 6. In a nod to social photo sharing, these albums have comment support and your friends can look at them there. These albums or ‘Shared Photo Streams’ are synced to all devices. In an effort to offer some kind of prioritization to your incoming email, a new VIP feature allows you to set the most important people you receive mail from. Their emails will get sent to your lock screen, and there’s a special VIP mailbox. Inserting photos and videos directly into emails is possible at last – something that has always been posible by copying and pasting, or starting an email from your gallery – but it should be a lot more logical for a lot more people now. 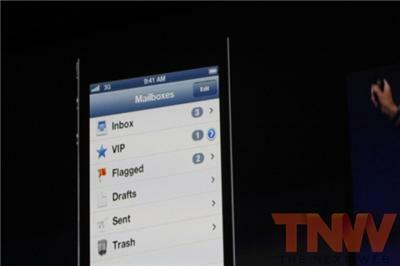 Meanwhile, that incredibly popular UI feature, pull-to-refresh, is coming to Mail. The new Passbook feature will allow you to collect boarding passes, store cards, movie tickets and the like in one place. 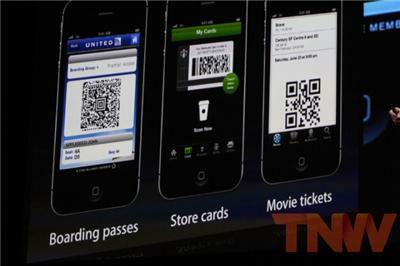 Your ticket for a movie, for instance, will pop up on the lock screen when you get to a movie theater. These passes can be built by third-party developers using templates from Apple. The passes are dynamic and can be automatically updated. If the departure gate for your flight changes, Passbook will change it on your pass without you needing to do anything. Apple has unveiled its new, Google-free Maps service for iOS. 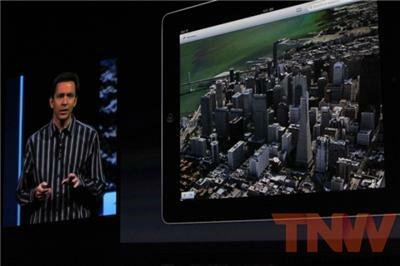 The interface is completely new, with local search data and custom mapping tiles from Apple. 100M business listings will be integrated at launch. There is also a Traffic information service. This is where Apple will use anonymous data from iOS users to keep the data fresh. Turn-by-turn navigation is also built in. It re-routes you around traffic, works on the lock screen as well, and has been integrated with Siri. A 3D fly-over feature uses vector graphics, based on Apple’s own set of 3D data, created by flying over metropolitan areas with planes. Just like Google. An option to send a quick text message as someone calls you, if you can’t answer. You can now set reminders for when you leave, as well as arrive at, a location. A ‘Do Not Disturb’ feature that won’t light up your screen when notifications arrive, but they’ll still be in Notification Center, when you’re ready to check them. Facetime now works over a 3G or 4G connection, not just WiFi. Your phone number and Apple ID are now unified, allowing you to answer calls from your Mac or your iPad with Facetime. A new ‘Single App Mode’ will be popular with museums and other organizations that use iOS devices for a single function, such as an on-site interactive guide. In this mode, the home button is disabled, so users can only use the app they’re supposed to. Redesigned App Store and iTunes Store apps. A new ‘Lost’ mode that lets you send a phone number to the phone, letting someone who finds it call you directly. iOS 6 goes out to developers in beta today, and will be available to all in the fall this year. Check our round-up of everything that Apple announced today the WWDC keynote.